In my May 1, 2017, BYGL Alert! posting (Please Report Early-Bird Periodical Cicadas), I noted that Gene Kritsky (Mount St. Joseph University, Cincinnati) was predicting that we will see an "early emergence" of some members of Brood X of the 17-year periodical cicadas (Magicicada spp.) this spring even though this brood is not expected to emerge full force until 2021. In fact, as you can see by the photos I took in Springdale (Hamilton County), OH, the emergence is now well underway. Brood X is the largest in terms of geographical distribution, ranging from Georgia north to Michigan, and east to New Jersey. This includes parts, but not all of Ohio. 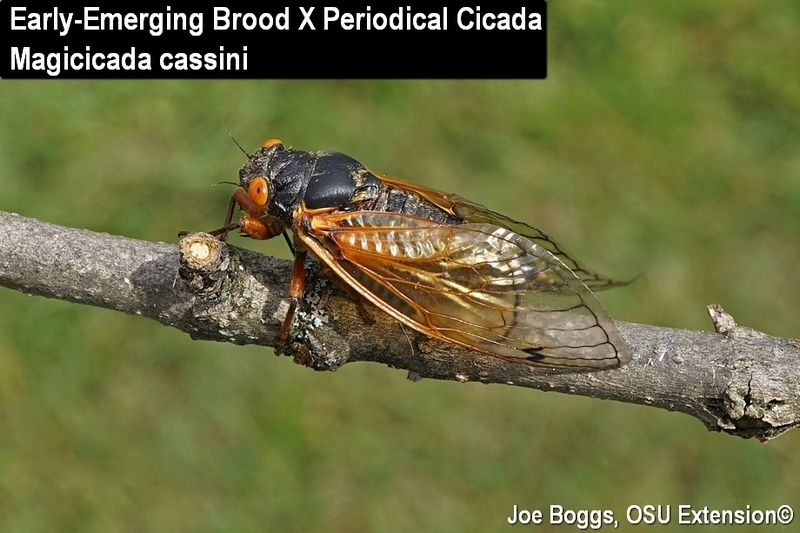 I spoke with Gene yesterday and he said that so far, he's gotten almost 200 confirmed reports (images provided) of these "accelerated" cicadas emerging in Ohio as well as many other locations within the historical geographical range for Brood X. As he noted, the numbers of cicadas emerging are nothing like the Brood X mob that will appear in 2021. However, there are certainly enough of the early-birds to be noticed. Are you seeing periodical cicada adults? Are you seeing cast skins hanging on tree bark? Are males "singing?" Periodical cicadas make a unique buzzing sound; they don't sound like any other insect or animal. Are males "chorusing?" If there are enough of them, the males will start synchronizing their singing to almost sound like a single, loud individual. Are females jabbing their eggs into tree stems? Do you see tree stem dieback damage? What's Happening With This Early (Accelerated) Emergence? Brood X has historically included three species of periodical cicada: M. cassini; M. septendecula; and M. septendecum. You can tell these species apart by the presence or absence of yellow bands, and the width of the bands, on the underside of their abdomen. So far, cassini and septendecum have been confirmed within the mix of early emerging cicadas, but Gene expects we will eventually see septendecula. The early emergence ranges in size from sporadic to numbers high enough for the cicadas to be very noticeable. Males have started to "sing" with chorusing being heard in some locations in southwest Ohio and elsewhere. This is not the first time an early emergence of Brood X has been observed. All three species emerged in 2000 which was 4 years before the main Brood X emergence that occurred as expected in 2004. Based on the number of adults that emerged, mated, and laid eggs, as well as the number of eggs that hatched (85%) in 2000, it would be reasonable to assume an early emergence this spring originated with these early-bird stranglers. However, Gene noted this is not the whole story. Some of these accelerated cicadas were further accelerated to emerge in 2013! In fact, Gene and others have been observing accelerated development of several 17-year cicada broods, not just Brood X, throughout the range of periodical cicadas in the eastern U.S. In my May 1 BYGL Alert!, I surmised that the early-bird Brood X cicadas may simply represent a natural divergence that could eventually give rise to a new brood. However, this does not explain the acceleration being seen with other broods. Keep in mind that insects are "cold blooded" (ectotherms) meaning that their internal temperature and thus the speed of their metabolism is directly tied to the temperature of their surroundings. This also means that the speed of their development, from eggs to adults, is influenced by external temperatures; the warmer the temperature, the faster their development. As Gene and others note, the most plausible explanation for why we're seeing such a consistent acceleration of development across many broods of the 17-Year periodical cicada broods is climate change. For further reading and updates on what's happening with this and other periodical cicada broods, check-out the informative websites below under "More Information."